I asked for, and was granted, a day off from work last week. I got Friday off, which resulted in the luxury of having two 3-day weekends in a row. As my mini-vacation approached, I realized that I should do something proper with the time off (besides just being lazy and sleeping in at my apartment). I thought about embarking on another camping trip. But the downside to this idea was that it would take place in Arkansas during the summer. The temperature was running dangerously close to 100 degrees, which really isn't the ideal time to be anywhere that isn't air conditioned. I managed to find someone else crazy enough to go camping in the summer - Zack. We agreed to meet up in Conway on Thursday afternoon, and then drove up to the Buffalo National River. The plan was to camp at Steele Creek, which is one of the prettiest places along the river. An added benefit to camping here is the proximity of the Ozark Cafe in Jasper. Whenever things got too brutally hot, we could always make the drive to the air conditioned comforts of the best restaurant in Jasper. We drove up to the Steele Creek campground, and managed to snag a good campsite. When you go camping in the heat of the summer, one of the luxuries that you seek out is shade. The spot we claimed had a good deal of shade during the day, which made it like the Taj Mahal of campsites. After getting everything set up at the campsite, we headed down to the river. 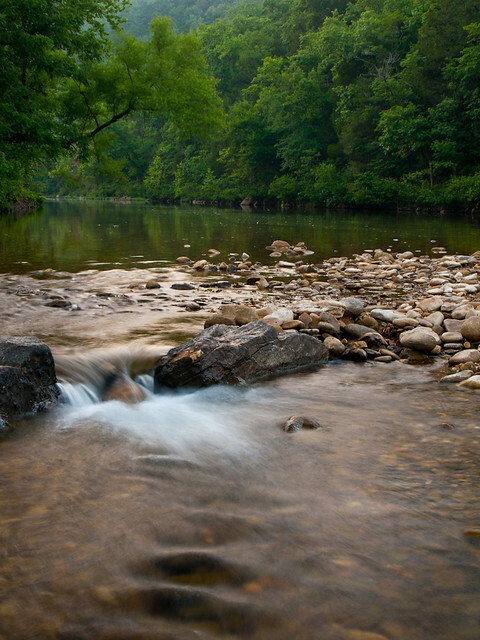 There hasn't been much rain here this summer, and the Buffalo River was running very low. As dusk settled in over the Ozarks, we set out to take a few pictures. 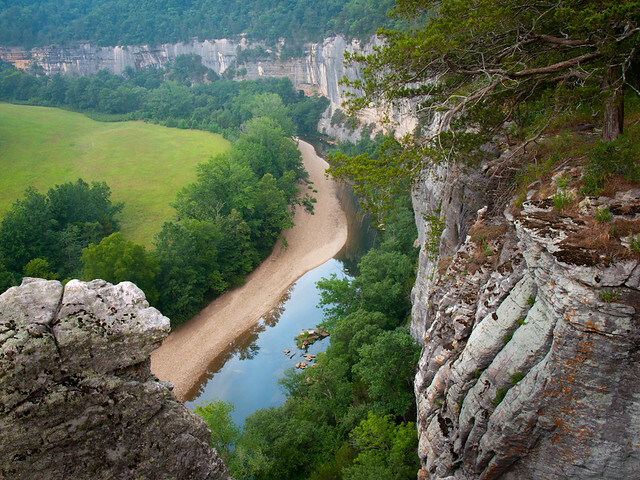 This is a view of the bluffs along the Buffalo River, near where Steele Creek usually flows in (it was bone dry that day). 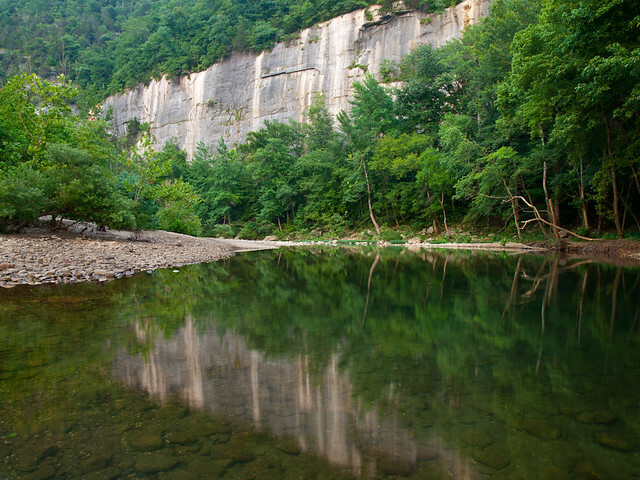 This shot was taken while actually standing in the middle of the Buffalo River. It wasn't very deep, but I had to try to stand as still as possible in order to not ruin the reflection the water. And also I was extremely scared that I would drop my camera in the river. We both woke up early the next morning (sometime around 5am) and headed back to the river. 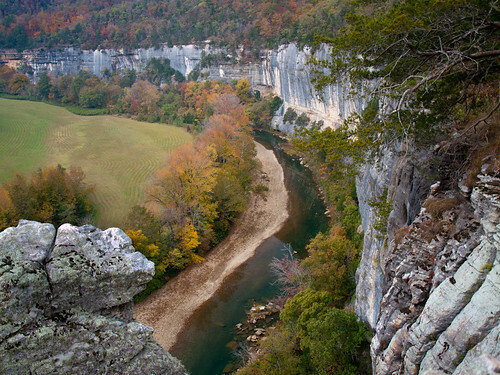 There is a short trail that leads to an amazing overlook along Roark Bluff, about 200 feet above the river. To get there you have to cross the Buffalo River (which was an easy crossing considering the water was low), and then hike into the woods along a faint trail. The trail runs through woods, which I assumed were full of snakes. We made it to the overlook, which sits on a narrow stretch of rock sitting high above the river. This is not a place to visit if you are scared of heights. It's also not a place to visit if you don't like blood-thirsty bugs. I plucked several ticks off of my legs while out on the bluff that morning, happily flinging them over the edge into the abyss below. The hike through tick-infested woods was worth it, considering the amazing views you get. 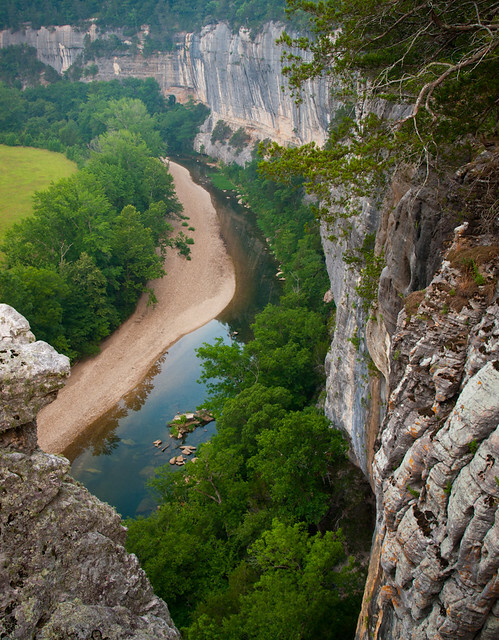 Roark Bluff runs for nearly three-quarters of a mile, and is the longest bluff along the Buffalo River. But before the sun came out, we retreated back to our campsite. We spent the rest of the day relaxing in the shade of the campsite, cooling off in the waters of the Buffalo, or basking in the air conditioned luxury of the Ozark Cafe. It was a nice and lazy day, even in the heat and humidity of an Arkansas summer. 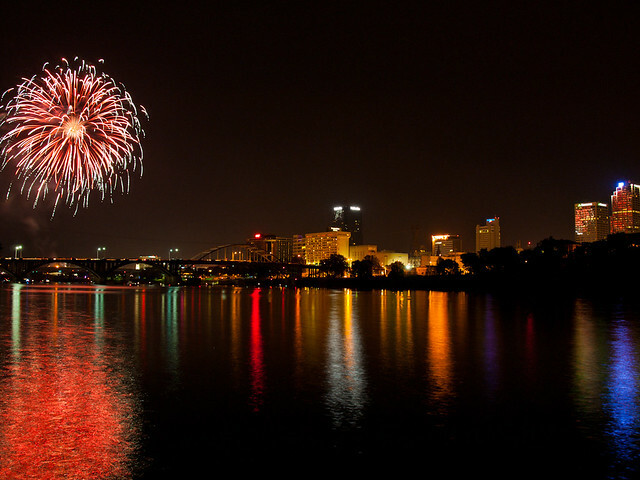 Independence Day is a great holiday - my office was kind enough to give me a three day weekend, and I delightfully slept in on as many days as I could. But the holiday is one where you must reflect on the effort made by our forefathers back in the 1776, who revolted against English tyranny so that today we can sleep till noon, then drink beer and shoot off explosives. USA! USA! Eventually, I made it to Riverfront Park in downtown North Little Rock. There is a spot there along the river, just by the Baring Cross Bridge, that provides a nice view of the skyline. I thought it might be an interesting angle to take pictures of the fireworks too. 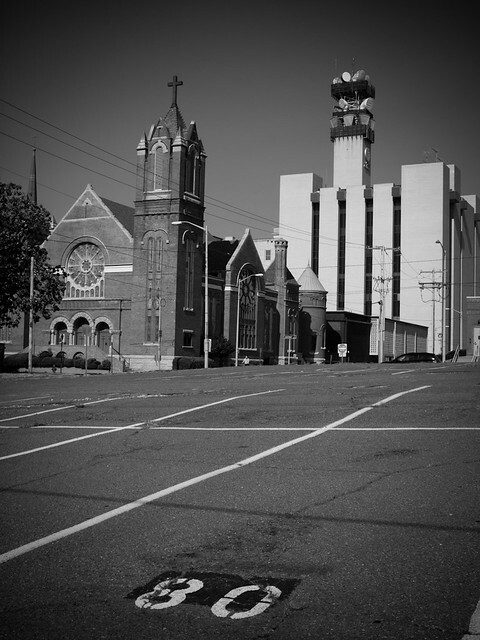 Eventually a small brigade of photographers were there, and the cameras and tripods were strategically placed. Of course, as people walked along the River Trail by us, they asked the question that one usually hears when standing next to a camera on a tripod: "So you out taking pictures?" I'm always tempted to say, "No, actually I'm baking a cake right now."